It got me thinking, “what is the next homeowner going to think of some of my decisions?” Whenever I make changes or repairs to the house, I try to do it at least as well or better than a professional would. Not that I always succeed — sometimes I don’t have the skill or the time. I’m sure there are some things that I just live with that would make another person shake his head. Since I know I can’t be the only person that runs into thing like this, I’m putting this question out to our readers: What is the weirdest repair you’ve run into or will admit to doing yourself? Let us know in the comments. Funnily enough, I did this exact same thing this last week when replacing the old tacky-looking brass hinges on the doors in the house. For some reason, several of the screwholes for the hinges were stripped out. I pushed the anchors down into the doorjambs and then put the hinges on just like normal. It was the quickest and easiest solution for me. Holy smokes, don’t get me started on the monument to half-assedness that I bought a few years ago. -The duct tape reducer from the sink to the p-trap in my master bath. – The outlet for the 1500W microwave that was wired to the same circuit as the entire rest of the kitchen. – Insert a half-assed job at anything that the guy touched. He wasn’t skilled enough or was unwilling to try and too cheap to hire someone to do it for him. I hate him for that, but he’s provided me with no end of projects. The real gripe is that I would rather do something of my own choosing right the first time, rather than having to fix someone else’s mistakes. I *will* leave this house in better shape than when it was sold to me. 1) A 220V outlet in the basement that was paneled over. I can’t think of what it was for. No, not a dryer, we’ve got a gas dryer upstairs (there’s a 220V outlet there too, though). 2) An outlet for an above-ground pool installed with romex (not legal in this community), that ran to a ceiling-based outlet in the garage… and shared a circuit with the dining room and the kitchen outlets and lights. Those outlets included the stove, which in previous incarnations only lit the oven, but in a newer one, the glow plug for the oven. 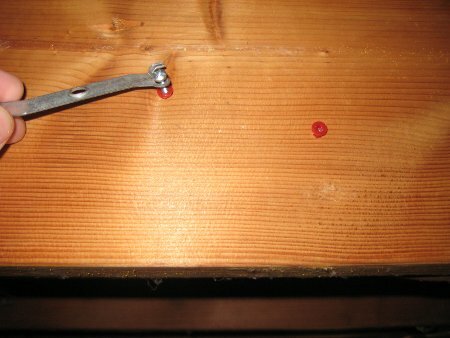 Opening the garage door when starting the oven would blow the circuit. The circuit would blow periodically without doing anything, and we didn’t realize the outdoor circuit was piggybacked on all this, until we saw steam coming out of the ground where the romex insulation had been broken by the previous owner’s landscape border, and 8″ of insulation had been eventually burned off. Yes, it’s been fixed, and more circuits installed. As a kid, our landlord “hired” his brother to do repairs to our mobile trailer home. A couple I remember are unfinished 2×4 baseboards around the entire bathroom…making the door only open to 45° and using 1/2″ ply to fix a hole in the 3/4″ ply kitchen subflooring by using the screws as standoffs. Every GFIC outlet in my place (5 total) are all tied to a single GFIC junction in my garage. Imagine my surprise when I thought nothing was ground fault protected and started replacing them only to find out I couldn’t get anything back on after testing it. Took me over and hour to find that single reset switch in the garage and it wasn’t even located anywhere near water. Brilliant! How about the romex that I “discovered” in the ceiling while drilling holes to install a new smoke detector? The previous owner had run the romex to the ceiling fan/light on the surface of the plaster ceiling then covered over that with acoustic tiles. At some point, that was then covered with a layer of drywall. Fortunately the circuit breaker worked! Nothing so weird as these – when I cleared a slow drain I ended up taking apart the trap and pulling 3 toothbrushes out. The only WTF I’ve found so far is the bathroom faucet supply lines that popped up under the vanity and ran across the floor before entering the wall to reach shutoffs in the usual place, which torpedoed our plan to replace the vanity with a pedestal sink. A friend found some mega-wtf construction while remodeling his house which had been “rebuilt” after a fire by Moe Larry and Curly. The main thing is to make sure your house never ends up in the “postcards from the field” section of this site http://www.ashireporter.org/ (American Society of Home Inspectors). Our house was attached to its foundation with nothing, but Liquid nail by the builder. There are “windows” in the 60″x40″ garage that are sliding glass windows turened sideways, 3 of the 4 are only held in with great stuff insulation, the 4th has been screwed in by us. The previous owners of my house were very safety conscious. There’s a fire extinguisher and a big first aid kit in the garage. There’s also a battery powered smoke detector a foot away from the hardwired one. Unfortunately, there’s a pet door installed in the inside garage door. I don’t think the pet door is fire-rated, and they were never educated on the dangers of CO poisoning. Hopefully they trained the dog to use the fire extinguisher. In my rental unit, the previous owner (not my landlord) and his father in law succeeded in installing flooring which had not one, but at least three 1″ gaps between floor boards. They also invented the “barely there” tile floor, as in, the tile floor was barely holding on there. They held no deck should be without warp. An intake line burst due to faulty installation (wonder who?) and flooded the entirety of the place…the landlord had to replace everything…and I mean everything. (1) The owner drilled a hole through the wall to the outside and ran an extension cord through it in order to make a back porch light. (2) One leg of the 220 line in the garage was split and continued at the dryer to make a 110v garage circuit. (3) A large hole made in an exterior wall to put a portable air conditioner propped up by a 4×4 touching the ground — which is where the termites got in. (4) Joist hangers installed upside down on the porch – I think kind of on purpose because the joists are sort of cantilevered off of the rafter tails. Probably not a big deal, but odd. (5) DIY roofing job, which is actually pretty good, but not enough attic ventilation and not enough extension at the eves to keep water from weeping back and rotting out the wood. (7) outlets grounded to an outside grounding rod. The rod was a 1′ piece of aluminum grounded with telephone wire. (8) Water tap for fridge water supply installed UNDER the house. Stalagtites! (10) shower grout covered with what I think was porcelain repair paint. On the other hand, we bought it ‘as is’ appropriately discounted and couldn’t have afforded a house otherwise. Ok guys, this video is perhaps the most incredible example of bad electrical that I have ever seen. I watched it at work with the audio off…it doesn’t matter – the visuals had me reeling. Either WA does not have the same inspection requirements as we have in CA, or the inspector was s***faced. I thought my first house (a rental) was bad! If I saw that as the realtor was showing me the house I would run – not walk – away. 1) The previous owner spackled lots of nail holed in the wall…. and painted over the spackle…. BUT they never sanded, nor even scraped clear the spackle they put on… so I have mountains under paint, which is hard to get flat. 2) The home inspecter required about a dozen outlets to be converted to GFCI. Instead, they ripped the outlets out, capped off the wires, and put sheet metal over them. Here is a BIG F YOU to the previous owner. what a jack a$$… if you dont know how to do home improvements, pay someone to do it. The worst I have seen, was at my dads house when I was helping him renovate the kitchen. First some backstory, the house is older so it was originally wired using knob and tube on two circuits. plenty for the demands of the day. Of course at some point some upgrades were performed and a 60 amp panel was installed in the basement. so both of the K&T circuits were spliced into one 14-2 cable and connected to one breaker on the panel and then the splices were covered with the kitchen cabinets. No wonder that breaker always overloaded. The AC compressor was fused with two 2″ long pieces of copper pipe. The previous owner was an electrical engineer and said it was installed that way. At some point, the previous occupant had set the ceiling on fire, probably from attempting to use the faux fireplace. The patch work of repair materials included concrete in place of joint compound, which would fall out in 2 foot square chunks! But for strange materials, I think I hold the prize myself: I wanted to drop a rope between the walls to use as a fish line. The plaster was removed everywhere, so getting between the walls was no trouble, but getting the rope to drop required a weight on the end. Since it was handy and I was lazy, I used the dog’s collar. Worked fine, except that the collar fell off the line. I sometimes speculate about who ever opens that wall back up again, what will they think when they find a dog’s collar, with name tags, buried in space too small for a dog? when replacing a drop ceiling in a bathroom found overhead wiring…bare copper nailed to the ceiling through chunks of rubber tires! Once owned an 80’s vintage home that had been taken over by the bank before it’s completion. They finished the house with $3 passage locks, faucets & ceiling fixtures. There were no faucet shut offs. The unsupported corner sink front (no cabinet) had collapsed onto the dishwasher with the laminate counter top seam as the pivot point. None of the “builder white” exterior doors closed correctly because the hinges had never been tied into 2x framing. The deck was built with drywall (not decking) screws and the 8′ tall-15×20′ structure was simply leaning against the house. It took me the better part of a day to remove doubled roofing nails from all the shingles and almost a week to re-engineer a poorly designed roof valley. I was the third owner. This house was already 15 years old when I purchased it. I’ll save the wallpaper story for another time.. Previous owner had put plumber’s putty in clean out plug opening of shower trap so he would have flat plane on which to sheet rock the basement ceiling. Since the house was vacant for months before we moved in the putty shrank. My first shower softened and removed most of the ceiling in the basement room below. my favorite. late 1800’s house with trough wiring i was doing a bit of electrical work on. from what i’d seen about 80% of the house had been converted to knob and tube, or romex over the years, but there were still a few runs of of trough around. while looking for another line in the attic i found an un-covered live trough with it’s cap near by (that clearly hadn’t been covered for decades by the volume of dust in it), but the odd part was it was it had thinner wire than the rest of the house. chasing it back, i found out why. someone had replaced the line to the panel with romex, and getting to the attic, they wanted to tie into an existing circuit spanning a few rooms, but didn’t want to run romex to all of them, so they split the romex, and stripped the wires bare for a solid 10 feet before tying it into the circuit with wire nuts. I was remodeling the basement, and when I pulled down the acoustical tiles that were up there, I found a gap about 12 inches wide where the previous homeowner had run romex to put in a light fixture, and not drilled through the floor joist. Instead, he had just looped it down around the joist and left a gap in the drywall that was then covered by acoustical tiles. I had to completely remove his wiring, and rip out all of the drywall in the process to find all of the shortcuts. The second great error in judgement he had used, is on the west wall where – instead of drywall – he had used 1 inch thick styrofoam! I don’t know if he thought it would give better insulation, or what, but it surprised the heck out of me when I knocked into it with a claw hammer, and went all the way through! This place is an adventure, to be sure! The first house my wife and I rented as a married couple was a owner-caused disaster. It started out as a very cheap and poorly constructed modular home – before the owner “improved” it. There were so many things wrong with it that the first thing I did when I walked in the door coming home from work was pick up my toolbox. The basement was finished by the owner and there were electrical violations everywhere. The finish trim in the basement was rough-sawn crate wood. But the big problem was the fireplace in the basement. It’s hard to explain, but to keep things short, there was a lot of flammable wood in places like the firebox and the flue. Unsafe to use. And the fireplace’s chimney had no flashing. One July morning after a heavy rain, we awoke to an inch of water in the kitchen. And since the place had cathedral ceilings, most of the incoming water flowed down the ceiling and down the outside walls and down into the basement, creating lots of mold. It took months to dry out the basement. We had wondered why the garage was decades older than the much newer house. Well, it turns out that the newer house was built using the proceeds from an insurance settlement – a settlement for the previous house which burned to the ground due to incorrectly owner-done electrical work for the furnace. – The phones in the entire house would occasionally fail for no reason. I tracked all the lines I could find. Then I found one connected to the humidistat. It had apparently been disconnected when a new furnace was installed. Someone saw an unused “phone” wire, and hooked it up! -The 1930 Kohler cast iron sink was “refinished” with cobalt blue automotive paint. – They were supposed to replace part of the roof before we closed on the house. Day of closing, we went for final inspection. They had torn off 2 or 3 layers of asphalt, but LEFT THE ORIGINAL WOOD SHINGLES ON, tar-papered over them and covered it with 40-year asphalt. You could clearly see them from inside the attic, through the roof planks (no plywood at all). @Fong, receptacles in attached garages are required to be GFCI protected, unless they are inaccessible (ceiling-mounted, for instance). The worst thing in our house was the house sewer “cleanout” in the crawlspace. It was a piece of sheet metal laid over a large hole in the top of the sewer. Just outside the foundation, the sewer line changed to clay tile, which was badly invaded by tree roots. The first time the roots clogged the tiles, the house sewer backed up, flowed out through the cleanout, and flooded the crawlspace with raw sewage. In my second house (1901) I was redoing some electrical in preparation for new 200 amp service to replace the old fuse panel (located in a small closet with about 2 dozen blown fuses “if the 15 amp fuse blows get a 20, if that blows go for a 25, aw hell just screw in a few 30 amp ones) I cut one piece of knob and tube wire and put out the lights on floor 2&3 an assortment of receptacles in the living room,kitchen,and bedrooms. At least with plumbing – most of the water pipe mess-ups we see will not burn the house down – but got to chuckle at well meaning homeowners who make things far worse before they call a plumber. I’ve seen prefectly serviceable fixtures rendererd “un-serviceable” with epoxy. In the burn-the-house-down category – how about Tygon tubing with hose clamps as a flex connection to a gas dryer. Then there was the house that had older2 wire electrical service that was “upgraded” to “3-wire” by running ground wires from outlets to “ground straps” on any pipe (including gas pipe and plastic pipe ” that was handy. In my house, all of the mouldings done by the last homeowner are cut at 90 degrees, and not coped. Looks better than the house next door though. They put in pergo. No leveling of the floor so it creaks when you walk on it. The quarter round around the room wraps around the door mouldings where it’s coped (kinda) into the kitchen. I figured replacing the 90 degree stuff would be easier than replacing where they screwed up the pergo installation around the door. I am afraid to do too many projects around my own home because I am not sure what I will find from the last guy who lived here. It is really frightening to unmask even more serious issues. My house was pretty basic it when I bought it – plywood doors for cabinets, laminate counters. The previous owner embedded a granite surface plate into the island counter for a prep surface. Actually, not a bad idea, it works well. My house was pretty basic it when I bought it – plywood doors for cabinets, laminate counters. The previous owner embedded a granite surface plate into the island counter for a prep surface. …and what reader of Toolmonger would not want a surface plate in the kitchen? Might have to arm-wrestle the wife over a drawer to store the gauges in, though. Let’s see… moved in in January (on the Canadian Prairies) and had one outlet in the garage that didn’t work, by the time summer rolled around and I could look into it, traced the wiring back to a switch circuit off the panel that ran up through the cold air return (!) into the ensuite to a switch there. Guessing he’d get up in the morning, go to the ensuite and turn on the car heater in the garage with the switch by the sink! And the garage wiring… he used a single bulb ceiling fixture box as his break off points for all his runs, must have been 15-18 conductors running through that thing. I went to where the BX cable came out of the ground, and snipped there and started from scratch. -there are several bath/sink refinishing methods that at various times (and now) are accepted as good practice (although maybe not best) and automotive paint has been ok for tub and sink refinishing. a number of refinishing products look like auto paint too. -the roof is actually correct. the original wood shingles functioned as we now expect sheathing to, and if not rotted out, the base layer of wood shingles should be left, if there wasn’t a support layer- which you said there wasn’t. best practice at that time was to double layer the shingles (or triple) and to replace a bad area, or simply recover the entire roof with new shingles as required. had the roofing contractor pulled the original shingles they’d have been removing a structural component of the house and needed to shore it internally to add heavier modern materials that wouldn’t have taken into account the shifts the house had made over the century and change. the un-required shoring could have added stresses to the structure, and damaged things as operational members were replaced with new ones reintroducing stresses to a stable system. your roofer did the right thing, as counter-intuitive as it may seem. Shingles are not a structural component of a house. Older homes have shingles attached to the structure by means of skip-sheathing, or horizontal boards spaced with gaps roughly equal to their width. These are likely the roof planks Jeff was referring to. Common practice where I live (CA) is to limit roofing layers to 3 (code requires this), then tear-off goes down to the orignial skip-sheathing. Plywood or OSB goes down over the skip-sheathing, then tar paper and new shingles. we recently bought our first place and were inspecting a place we put an offer in on. The kitchen had a suspect amount of blank plates in the walls hinting at electrical fixes or more DIY badness that we found in the unit. So with the seller’s realtor standing there my contractor buddy starts poking around (as he was hired to do) and takes off one of these cover plates behind the gas stove. Underneath we find two lines of romex that have been stripped back, with each wire stripped back (white black and green!). I groan because I know the house hunt will now continue, but he decides to continue himself. He announces to us both, “Well this COULDNT be live because these wires would have shorted together somehow, right?” and proceeds to touch the hot to another wire. Well after the CRACK and a small puff of smoke and the lingering taste of ozone I have to almost pry the realtor and him apart as they begin to fight like i’ve never seen two “professionals”. I still don’t know why the stripped the wires, made the circuit live and some how managed to get the wires into the 1-gang box without shorting anything. All this about 6″ from the gas line. The house we’re currently renting has led me to create my own personal rule of real estate: Never buy a house within walking distance of a Home Depot. We’re literally a block away from the Orange Despot. I love it, in that it’s oftentimes easier to just walk a cart full of lumber home than it is to load it in the truck, drive home, then unload. On the other hand, there’s some seriously scary stuff going on inside that house. Every time I try to do something, I’ll get down to the layer that I think I can start building back up, and discover that there is another two or three layers of stuff I’d need to fix before I could even really say I’d actually fixed the problem. Best one: The garage used to be an unenclosed carport. At some point they removed a section of the house siding that’s inside the garage, and rather than just cover it up, with OSB or ply they made new siding. New siding made out of drywall. 10 inch strips of drywall, overlapping each other and painted the color of the siding that’s in the garage. @mike47 yes, i wasn’t going into *that* much detail. Amazingly the house did not collapse in, in fact when I bought it several years later the beam ends had just drooped and twisted a bit, well a lot. I credit the solid wood subfloor (diagonal)+ solid wood floor, with holding the house together. I got the house *very* cheap, I think the beam situation scared of a lot of prospective buyers. I jacked up the beam and slipped in supports on each side of the stairs. It’s amazing how much abuse a traditionally built house can take. If you tried that in a modern house with those fancy pressboard I beams it probably would have collapsed before you finished the first cut. The phone story reminds me of what I had to do in high school to help my brother out with my mom’s consent. His high school sweat heart would keep him on the phone for hours to the point of falling asleep and he already had problems with studying. So the evil electrical genius I am, I came-up with a solution. A sprinkler timer and a relay, using the extra wires in the phone lines. I had it set-up so that the phone only worked for 15 minutes and then would go dead for 15 minutes. My brother was completely baffled at why we didn’t call the phone company in to fix the lines. Fortunately, I restored the wiring before the house was sold.